On March 7, 2017, City Manager Wendell Johnson's secretary, Joyce Bruner sent out an email notice that there would be a Community Redevelopment Advisory Committee meeting: "Subject: CRA Advisory Committee Meeting. No meeting date was provided. The body of the email stated: "The agenda will be sent out prior to the meeting." During the recess, after City Attorney Fred Koberlein (standing) researched the meeting notice issue, he conferred with Mayor Witt (black shirt) and Councilmen Hill and Ward. On March 9, 2017, the City Clerk's Office sent out a notice to the Lake City Reporter (LCR), the print newspaper of record in Columbia County, and to the Columbia County Observer, which stated the following: "Please find attached a copy of a block ad for publication on Sunday, March 12, 2017. Ad size is 2 column x 3 inches. Please send confirmation. Thanks and have a great day." On Friday, March 10 at 4:51 pm, Joyce Bruner sent out the agenda for the March 14 (Tues.) meeting. The agenda included one phrase about the pending façade grant request: "Candler Business Office CRA Support Request." Double Eagle Investors, LLC, the group that was requesting the grant, was nowhere to be found on the agenda. 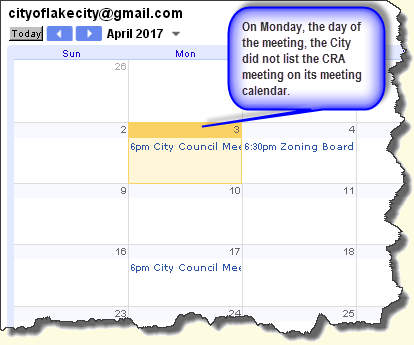 On Sunday, March 12, 2 days before the CRAC meeting, the LCR ran an ad which stated the following: "NOTICE IS HEREBY GIVEN that the Community Redevelopment Advisory Committee for the City of Lake City, Florida will hold a meeting on Tuesday, March 14, 2017 at 5:30 P.M., in the Council Chambers located on the second floor of City Hall at 205 North Marion Avenue, Lake City, Florida. All interested persons are invited to attend." Because the meeting notice was not published in the legal notice section of the newspaper, it was not posted on the Florida Public Notices website. The advertisement did not state that an agenda for the meeting was available, nor did it state any of the other required information. No supporting information for the meeting was provided via email, the usual way the City provides such information. No supporting information is on the City website. The minutes of the March 14 CRAC meeting are not available. It appeared that the City CRAC approved something for Candler-Double Eagle that night. It is unknown if City Councilwoman Moses declared a conflict and abstained from the voting due to her relationship with one of the principles of Double Eagle. The issue came up again this past Monday, April 3, when the City Council met as the Community Redevelopment Agency, to vote on giving Double Eagle a $45,000 façade grant. By CRA resolution, on December 6, 2010, the City approved the CRA Façade Grant Program. (a) Existing business building owners that do not currently have a City Lien against their parcel are eligible to be reimbursed one-time for 75% of the cost of materials and professional contracted labor for completed exterior renovations. Each storefront/business address is eligible for a maximum reimbursement of $5,000, with an overall maximum reimbursement of $10,000 per property that contains multiple storefronts/businesses. For businesses that improve both public entrances from public parking lots and their street address they would be eligible for a maximum reimbursement of $5,000 per improved entrance with a maximum reimbursement of $10,000 per business. Businesses must be a conforming use in the redevelopment area. Grants are awarded on a first come, first completed basis for each fiscal year (Oct. 1 - September 30). Projects that have been approved and completed in any Fiscal Year in which grant funds may have been expended will be reimbursed at the beginning of the next fiscal year. Your reporter attended Monday's CRA meeting and looking for some answers addressed the City Council, which acts as the Community Redevelopment Agency (CRA). The Observer: I noticed that through this afternoon this meeting was not on the City Calendar. I was wondering how people were supposed to know that this meeting is happening tonight. Mr. Koberlein (the City Attorney) might have a chance to see if it is there now. I haven't had a chance to fire up... It wasn't announced a week in advance. It was only announced in this Sunday's newspaper, even though the notice went out the week before." Your reporter concluded, "If you could answer those questions. I guess the primary one is, how anybody is supposed to know that this was going to be on the City's agenda tonight, when it was only announced on Sunday... Mr. Koberlein could tell you about the "appearance of impropriety." If you guys knew about this a week before, why it was only advertised on Sunday? I don't get the newspaper. I know a lot of people that don't get the newspaper. I don't know how this is fair to the public. Maybe you could help me with that. Thank you." Mayor Witt addressed City Attorney Koberlein, "Mr. Koberlein, are there any issues with the notice?" Attorney Koberlein responded, "Mayor, I don't know how long the ad's been noticed or where it was noticed, but there are special notice requirements by statute of the CRA. As you know, I don't sit in the CRA meetings all the time... I will look into it." Long story short: the CRA is, by FL statute, designated a dependent special district. It must abide by the laws for all governmental bodies for adequate public notice, which the agencies determine. Were the CRA an independent special district, which it is not, then it would have to advertise its meeting notices 7 days in advance and provide all backup material which is available. Mr. Koberlein responded to the Mayor, "If you want to recess this meeting for a few minutes -- we can start it up again at six o'clock. I'll try and have an answer for you." Mayor Witt responded, "We can do that." A minute after the first photo, Attorney Koberlein conferred with Mayor Witt, City Manager Johnson (left) and Councilman Jefferson. Councilwoman Moses is far right. Mr. Koberlein spent a few minutes looking at his computer and mentioned something to City Councilman Ward about this being a "pop quiz." After Mr. Koberlein was finished doing his research, he walked around the dais and conferred with the Mayor, City Manager, and Councilmen." Mayor Witt reconvened the meeting and announced, "Out of caution and after consulting with our legal counsel I would recommend that we table this to the April 17 meeting and we will have it at 5:45 at that time." It is unknown what City Attorney Koberlein said out of the sunshine. The Florida statutes required his remarks to be on the record. *Updated April 7, 2017: headline updated based on public records located in Alachua County.